Exceptional clarity for excellent product visibility. Bags have tight seal for vapor- and moisture-resistance. Won't scratch most surfaces. Meets FDA specifications for food contact. Usable dimensions are slightly smaller. 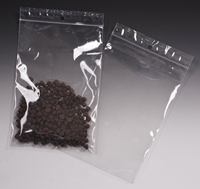 Resealable, flat, and gusseted styles also available.